I don’t know what it is but breakfast is one of my favorite things to cook. I was thinking about why I love cooking breakfast and I think it comes down to the endless possibilities that you can create with typical breakfast ingredients. For me, it typically involves eggs of some sort, avocado, tomato and anything else I am in the mood for. I rarely go for a standard fried eggs and bacon combo and this recipe is no exception. 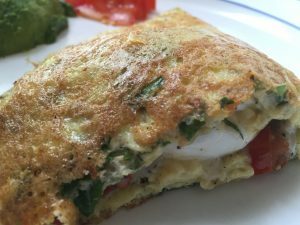 I’ve been thinking about doing this for awhile now and finally took the chance and made what I’m calling “Eggs in an Egg Blanket.” This is essentially inserting poached eggs inside an omelette to create a yolk filled pocket of joy. I have never heard of anyone doing this and have never had it before. So I am claiming inventor status. I hope you get the chance to attempt this. Enjoy! 2 – Rinse and chop your basil and add to a medium mixing bowl. 4 – Whisk the eggs, basil and coconut milk in a bowl. Add some salt and pepper. Set aside. 5 – Chop up garlic, set aside. 6 – Dice half of a tomato, set aside. 7 – Grate the cheese, set aside. 9 – In a warmed up pan over medium heat, pour whipped egg mixture and begin cooking the omelette. 10 – Once the omelette begins to set, drop your 2 other eggs into the boiling pot to poach them. I time my eggs to poach for a little more than 2 minutes when poaching but you can do yours however you like. To poach I crack each egg into a measuring cup and gently lower into the rolling water. Then after about 5 seconds dump the egg out into the water. It will tighten up on it’s own. I don’t swirl or do anything else. 11 – Add the tomato and garlic mix to one side of the omelette and top with the grated Parmesan cheese. 12 – After 2 minutes or so scoop out each poached egg, draining and removing any excess egg film. Add each egg to one quarter of the omelette and on top of the tomato mixture. Be careful not to crack your yolk!! 13 – Season with salt and pepper and add anything else you like at this point. Then gently fold the empty side over to cover the eggs and form the omelette. Be careful not to put too much pressure on the poached eggs. And make note of their placement in the pocket. 14 – If you are sharing this with someone else, you can now cut it. Take a spatula and slice right down the middle between the two poached eggs. 15 – Plate gently with some sliced tomato and avocado. You can accompany this with warmed tortillas or some toast as well. 16 – Remember to crack the yolk gently and enjoy the yolky goodness! ERMERGERD. I had a conversation with my boyfriend the other night about how we wished that omelettes still had runny yolks, so I decided to poach two eggs and put them inside of a steak and cheese omelette. It was amazing. Afterward, I was curious to see if there was a recipe for it, and yours is THE ONLY one I found. Props to you. 🙂 Everyone else is missing out.